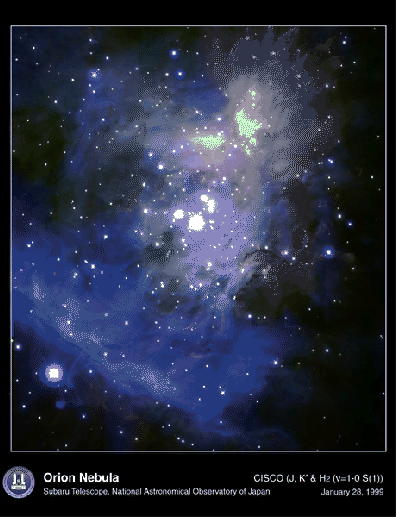 Figure 1.3: The Orion Nebula, as seen by the Subaru telescope. There are many other places in the galactic disk where the density of stars is high enough to make collisions likely, at least temporarily. These are the sites where stars are born. Fig. 1.3 taken by the Japanese Subaru telescope in Hawaii shows the Orion Nebula, also known as M42, at a distance of 1500 light years from the sun. This picture, too, is taking in infrared light in order to penetrate the dusty regions surrounding the young stars. The four brightest stars in the center, collectively known as the Trapezium, form the most massive stars of a larger conglomeration of stars, all recently formed from the gas and dust that still surrounds them. In order to study collisions in these star forming regions, we can no longer treat the stars are point masses. Many of the collisions take place while the stars are still in the process of forming. While a protostar is still in the process of contracting from the gas cloud in which it was born, it presents a larger target for collisions with other stars. In addition, a single contracting gas cloud may fission, giving rise to more than one star at the same time. In this way, the correlated appearance of protostars is even more likely to lead to subsequent collisions. The proper way to model these processes is to combine gas dynamics and stellar dynamics. Much progress has been made recently in this area. One way to use stellar dynamics in an approximate fashion is to begin with the output of the gas dynamics codes, which present the positions and velocities of a group of newly formed stars, and then to follow and analyze the motions of those stars, including their collisions.